If you manage multiple Instagram accounts as part of your social media marketing strategy, then we have good news: it’s easy to add and switch between Instagram accounts. And if you’re not using Instagram for your business yet, you might want to think about it. Instagram gives you access to 1 billion potential customers Plus, 71 percent of U.S. businesses already use the platform. With Instagram, you can manage up to five accounts from the same app. It’s easy to toggle between your work account, personal account, and the Instagram handle you made for your favorite cactus. Just make sure to double-check which account you’re posting to before you post! Bonus: Download a free checklist that reveals the exact steps a lifestyle photographer used to grow from 0 to 600,000 followers on Instagram with no budget and no expensive gear. If you want to manage multiple Instagram accounts from your phone, first you have to add them to your app. Don’t forget to update to the newest version of the app. Step 1: Launch the app, and then go to your profile by clicking the image in the lower right corner. Step 2: Open the options menu at the top right and then click on the gear to open your settings. Step 3: Scroll all the way to the bottom to Add Account. Step 4: Enter the username and password of the account you’d like to add. Presto! You can add and manage up to five Instagram accounts on a single app using this method. Now that you’ve added all your accounts to your app, it’s easy to switch between your Instagram accounts. Step 1: Go to your profile and tap your username at the top. Step 2: A pop up menu will appear. Select the account you want to use. That’s it! Step 1: Go to your profile and open the options menu in the upper right corner. Then tap the gear icon to open your settings. Step 2: Scroll down to “Notifications.” You can adjust your push notifications, email, and SMS notifications for this account. Step 3: Do this for each account. Get the free checklist right now! Did you green thumb not work out? It’s easy to remove that account you created for your once-favorite cactus (and any account you don’t want to be responsible for any longer). Step 1: Select the account you want to get rid of and go to your profile page. Step 2: Open the options menu, then click on the gear to open your settings. Scroll to the bottom. Step 3: Choose Log Out of [account name]. This account still exists, but it will no longer appear in the drop down menu when you toggle between accounts. If you change your mind, you can add it again by following the steps in the “How to add multiple Instagram accounts” section above. If you feel deep shame for killing your cactus, you can also permanently delete that Instagram account. Managing multiple Instagram accounts with Hootsuite is a breeze. First, you need to add Instagram to your Hootsuite dashboard. Step 1: Click on your profile icon in the launch menu and then select Add a Social Network. Step 2: In the pop-up window, select Instagram and tap Connect with Instagram. Log in and authorize Hootsuite to access your account. Step 3: Repeat steps 1-3 for each Instagram account you want to manage from Hootsuite. Step 4: Once all your accounts are added it’s easy to toggle between them from your Hootsuite dashboard. Just open the options menu at the left and click on Streams. Each of your accounts will appear as a separate tab. Step 1: Go to your profile and tap Social Networks. Step 2: Tap Add Social Network. Step 3: Select Instagram. Then login and authorize Hootsuite to gain access. Step 4: To add multiple accounts, repeat steps 1-3 for each account you want to add. When you schedule a new post, just make sure you create it using the right account. Then Hootsuite will automatically publish it as usual. Boom. That’s it. 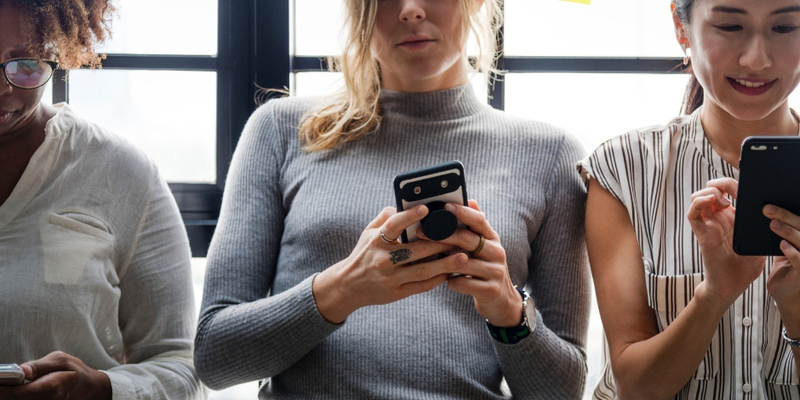 You’re managing multiple Instagram accounts like a pro. Want to level up? Check out even more Instagram hacks, or learn how to get the most out of your Instagram analytics tools. 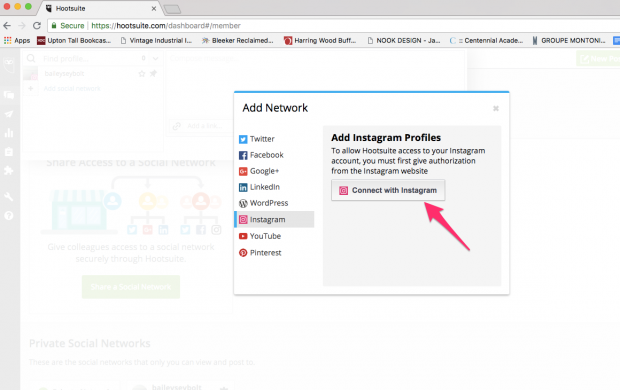 Easily add and manage multiple Instagram accounts using Hootsuite. From a single dashboard you can schedule and publish posts, engage your audiences, measure performance, and run all your other social media profiles. Try it free today. Bailey is a freelance writer based in San Francisco. She loves good books, big mountains, and has a weakness for Montreal bagels.